Macao – January 24, 2018 (travelindex.com) – The seventh edition of the Global Tourism Economy Forum (“GTEF” or “the Forum”) is set to be held in Macao on October 23 and 24. GTEF 2018 will present two of the most vibrant economic regions of the world, namely the European Union (EU) and The Guangdong-Hong Kong-Macau Greater Bay Area (The Greater Bay Area). In July 2016, Chinese Premier Li Keqiang and President of the European Commission Jean-Claude Juncker jointly announced that 2018 would be EU-China Tourism Year (ECTY 2018), with the specific objectives of promoting lesser-known destinations, improving travel and tourism experiences, providing opportunities to increase economic cooperation, and creating an incentive to make quick progress on EU-China visa facilitation and air connectivity. ECTY 2018 was officially launched at the Doge’s Palace in Venice on January 19, followed by a high-level Business Summit held in the afternoon. At the Opening Ceremony, congratulatory messages from Premier Li and Mr. Juncker were read. International dignitaries at the Opening Ceremony included Mr. Antonio Tajani, President of the European Parliament; Mr. Qi Xuchun, Vice Chairman of the National Committee of the Chinese People’s Political Consultative Conference; Ms. Elżbieta Bieńkowska, the European Commissioner for Internal Market, Industry, Entrepreneurship and SMEs; and Mr. Du Jiang, Vice Chairman of China National Tourism Administration (CNTA). Among the global tourism industry leaders and experts who attended the Opening Ceremony and participated in the Business Summit were Ms. Pansy Ho, Secretary-General and Vice Chairman of GTEF; Mr. Liu Shijun, Secretary-General of World Tourism Alliance and Mr. Dai Bin, Chair of the China Tourism Academy. 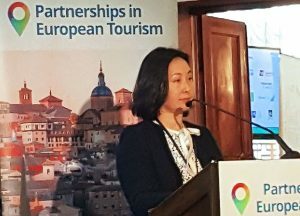 Explaining to EU-China tourism stakeholders why GTEF is a unique platform to achieve the objectives of the 2018 EU-China Tourism Year, Ms. Ho said, “GTEF… the first public-private-partnership initiative in China to champion the promotion of sustainable development of global tourism, with China, a significant stakeholder, as the core. Introducing Macao and the critical role she plays in global tourism, Ms. Ho added, “Macao is chosen as the seat of GTEF because, with over 450 years of east-west cultural mix, Macao has openness and inclusiveness in its DNA. Macao is the proud first-generation contributor and recipient of China’s outbound tourism. Since its return to Chinese sovereignty, Macao has grown its tourism arrivals from 6 million to over 30 million, with a population of 600,000 on 32 square kilometers of land area. GTEF 2018 will use its pragmatic tourism exchange platform to drive discussions on strengthening EU-China commercial and cultural exchanges and unleashing the full potential of the Greater Bay Area. At the same time, the Forum will provide opportunities to build EU-China cooperation and partnership through bilateral trade meetings, business matching, networking, workshops, exhibitions, and other initiatives. Since its inception in 2012, GTEF has successfully established itself as an influential high-level cooperation platform to promote sustainable development in the global tourism industry with a focus on China. To date, GTEF had received more than 8,000 participants from 83 countries and regions, including delegations from 105 provinces and cities of Mainland China; and 437 internationally renowned speakers.